I am excited to provide an update on the findings of this project, where we have found, through comprehensive analysis, that Bison are native to the Colorado Plateau throughout geologic time. Our results have been presented and peer-reviewed in the Southwestern Naturalist article (see above) and contributed greatly to my Master's Degree and Thesis. The question of nativity in conservation biology can only be answered through comprehensive paleontological and archaeological analysis, with methods presented in this project. The main research question is: Were there bison on the Colorado Plateau after the last Ice Age, between 22,000 years ago and when the Dominguez-Escalante Expedition traveled near the Grand Canyon in 1776? Some goals of the project include obtaining accelerated mass spectrometry (AMS) radiocarbon dates on bison bones from archaeological and paleontological sites across the Colorado Plateau and the Grand Canyon. These dates will then be imported into a data set that includes previously recorded fossil bison, and packrat middens. The packrat middens are important because they preserve climatic and environmental indicators that have been easily and accurately radiocarbon dated. The above factors, when combined, can be used in a geographic information system (GIS) to model where bison could have lived at certain times in the past. The importance of the dates is to make multiple ranges of ages in the past to create several models. Using GIS is the only means to really model the landscape of the Grand Canyon area and Colorado Plateau to see where bison could live sustainably based on packrat middens, and fossil sites containing bison. Bison are a keystone species for many ecosystems and their conservation is important to sustain the ecology of the Grand Canyon. There is currently a herd of approximately 300 bison owned by the State of Arizona that have migrated into the Grand Canyon National Park's property. The herd was first introduced to the area in 1906 by Charles "Buffalo" Jones, to preserve and conserve the bison, but in doing so, crossing bison with cattle, resulting in a hybrid species. Thus, the Grand Canyon National Park view these and all bison as a non-native, invasive, man-introduced species based on a previous report based on the lack of fossil remains of bison younger than 22,000 years ago. However, there was never a lack of bison, the problem lies in the collections where the specimens are curated. Many paleontological and archaeological sites have "large artiodactyls" recorded, but are not identified to the generic or specific level. Some of the published records claim having cattle at the sites, but the dates given for the particular site are too old, long before cattle were introduced to North America, let alone the Southwest. The funds will allow me to obtain 1 AMS radiocarbon dates on fossil bison bones from the Grand Canyon area and travel to and from the Grand Canyon. The funds will allow me to obtain 1 AMS radiocarbon dates at $700 each and $300 for travel to and from the Grand Canyon. I grew up on a bison ranch in Northwestern Wisconsin which is where I learned how bison behave, and react with their environment. I moved to Rapid City, South Dakota where I worked for another bison ranch on a grander scale as I was working on my geology undergraduate degree at the South Dakota School of Mines and Technology. After my third year I transferred to East Tennessee State University in Johnson City, Tennessee where I have been working with Dr. Jim Mead. 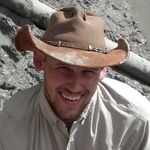 Dr. Mead studies fossil North American bovids, including bison, mountain goats, and bighorn sheep. I grew up on a bison ranch in Northwestern Wisconsin which is where I learned how bison behave, and react with their environment. I moved to Rapid City, South Dakota where I worked for another bison ranch on a grander scale as I was working on my geology undergraduate degree at the South Dakota School of Mines and Technology. After my third year I transferred to East Tennessee State University in Johnson City, Tennessee where I worked with Dr. Jim Mead to get my Master's of Science in Geosciences. I am a Ph.D. student and Boone and Crockett Fellow in the Dept. of Wildlife and Fisheries at Texas A&M University studying climate change impacts, specifically temperature, on bison and how it affects bison conservation and industry. I have worked with bison since 1999 in various capacities, as a rancher/owner, as a paleontologist, and as a wildlife scientist.